I would love to walk around Discovery Island, the island in Bay Lake not the land in Disney’s Animal Kingdom, River Country, the Image Works, the Skyway Stations in Tomorrowland and Fantasyland, or the Odyssey Restaurant. To see what had become of the places I remember, but took advantage of for always being there, from my child and young adult-hood would be tremendous. It is the pealing back of the curtain, the anticipation of what might be there, and the emotional, sad mixed with wonder, of what has been left behind. That being said, I hate that these areas are not being used for Guest experiences. I’m not saying that they should reopen the Skyway or that River Country should be cleaned up and repurposed as a special recreation area for Fort Wilderness and Wilderness Lodge guests (not that I would complain about that mind you), but these vacant spaces deserve better. They can be used to house new attractions or can be torn down, but the life they have now is the equivalent to hospice, living a life that is not the one they were known for or would want to be remembered for. River Country ticket booths that are still there but housing cases of soda cans and Fantasyland’s Skyway Station being used for stroller parking are not what these areas are remembered for, just what they have been relegated to. They would be better off razed to the ground and formed into new experiences rather than live as the shells they are now. These attractions deserve as much respect in their extinction as they did in their heyday, and should be removed or remodeled rather than left to rot. It seems that some moves have been made to remodel abandoned areas, such as the Wonders of Life Pavilion. Though some remnants remain of the salute to health, the majority of this building has been redone to allow it to live on as the home to Epcot’s events’ central. While not as grand a purpose as it could be, it still draws guests in and is better than soda storage. Guests who remember these once proud pieces of Walt Disney World would still have their memories of these attractions and, more than likely, a picture or two. Perhaps they could find life as an inside joke or homage, like the naming of Discovery Island in Disney’s Animal Kingdom or Mr. Toad’s marker in the Haunted Mansion’s pet cemetery. 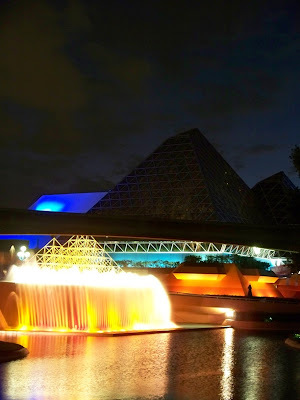 After all, there are very few Guests, outside of the Disney community, who come to Walt Disney World and know what these areas are, or rather, were, and those of us that do remember simply shake our heads as we walk or boat past these once giants among attractions. Walt Disney, with Disneyland, didn’t want Guests to feel like they were in their real world, he wanted them to inhabit another world. In the world I live in daily there are abandoned buildings and decaying structures. Of the Florida Project, Walt stated that, “There’s enough land here to hold all the ideas and plans we can possibly imagine.” Why then, with all that space available, would they want to remind us of the abandoned places we come from.